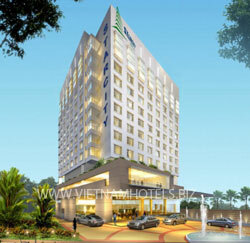 StarCity Saigon Hotel is a dynamic 4 star hotel with luxurious accommodations and high-end service. Ideally located, StarCity Saigon is only 5 minutes away from Tan Son Nhat International Airport and 2 minutes walk to the Centre Point Commercial Building. It is also near Tan Binh Exhibiton & Convention Centre and E-town Building, which can be reached within 15 minutes. StarCity Saigon Hotel offers 200 rooms and suite including Executive floor for added value and benefits. All rooms have been designed based on our core concept "Affordable yet comfort and friendly. Come and experience your home away from home. StarCity Saigon Hotel where you are truly welcome as our personal guests. Our La Mezzanine Restaurant offers what this region is made of. Blend of Western and Eastern. International cuisine and traditional Vietnamese dishes are served in a modern setting. Private section within the restaurant is the ideal venue for a small gathering business or pleasure; we are at your service. Non-smoking section is available. Vino Veritas offers large selection of wine both by the bottle and by the glass of all styles, origin from around the world to satisfy the taste of wine connoisseurs. Our fully stocked humidor holds premium, flavored and all famous brand cigar that perfectly goes together with the selection of your fine wine . The newest mingle place in town for socializing, business or pleasure enjoy wide selection of beverages and light snacks. From one dish menu for busy business travelers to a candle lit dinner for romantic couples, in-room dining is available around the clock in the privacy of your room.